(Nanowerk News) Designed to be the restaurant of the future, there will be no waiting lines and fewer health hazards—as the mechanical staff do not have to touch the food—at these fast-food outlets that seem right out of a sci-fi movie. Not only will service at these restaurants be faster, cleaner and more pleasant, the food would also be of gourmet quality—custom meat grinds for every single customer is also in the plans. 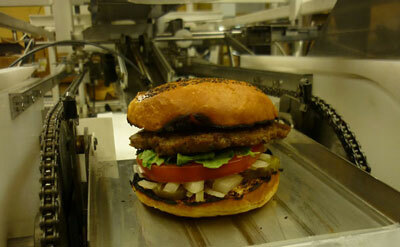 Capable of producing about 360 hamburgers per hour, is this human-free eating place a glimpse of a brave new world in the food industry, or the beginning of a robot takeover?